Excuse the name, I don't really want to call this a replica, partly in respect to Vince's great efforts, and partly to avoid confusion. If you have a better idea, let me know. I have all the hard to find parts on hand and am working on the finishing touches of the PCB. Take a look at these pages to what I have going on and please provide any constructive feedback or ideas before I commit to fabbing an initial batch of PCBs. Thanks for your feedback and interest. PS I have been helping an obtronix board owner investigate an difficult to bring up board. As part of this investigation, we have discovered a possibly missing trace on one, of his two Obtronix boards. The board with the missing trace was purchased as a bare board. The board that is not missing that trace was purchased as a kit and is working fine. This trace also appears missing on the scan that Vince posted, a while back. If you are having trouble bringing up or have had success with your Obtronix board, I would be interested to discuss this with you. On my Apple 1 nearly all the Standard TTL parts are Fairchild whereas the display parts (mostly MOS) are Signetics. Standard TTL was pretty tolerant of leaving inputs floating, I have never seen that cause a real problem, however the 74LS and later parts use a different circuit that is very sensitive and will cause problems. If you stay true to using standard TTL (74160, 74161, etc.) you should be OK but fixing the circuit is better. My Apple 1 seems very reliable. The Cassette interface is a different story. It has a 74LS74 with floating Set and Reset lines that could conceivably cause a miswrite. I am currently using an iPod connected through its 3.5mm Earbud/Microphone jack to read and write to the Cassette Interface. That works extremely well. I'm aware of the designed in floating inputs to the 74xx parts. This particular issue I'm referring to is a board that appears to not have the signal H10 connected to D10-13, leaving D10-13 floating. Where another board does have this connection. This apparently controls refresh of DRAM, but maybe it doesn't matter, the board will just refresh more frequently than the design originally called for. Why not just pull the 74ls74 set and clear inputs up with a couple of resistors (say 4.7K) tied to +5V. This could be done on the chip itself to avoiding touching the PCB. Just curious, how are you going to make it distinguishable from an original apple 1 motherboard? I'm putting a logo in the copper layer on the backside, as I did on the rev 0. You are right, the LS problem is pretty easy to fix, simply using a 7474 should be OK. A couple of other notes on the Cassette board, the schematic shows A1 pin 5 going to +5V but on the real board A1 pin 8 is connected to +5V and pin 5 appears open. A1 is a Motorola LM311 on my board and the TTL parts are all Signetics LS. Another interesting note on the board is that there are no power supply decoupling capacitors used. On an Apple II historic note, pre-production Apple II prototype boards did not have pullups on unused inputs and would sometimes freeze up. This was corrected before any production boards were built. I did some checking and on my board D15 Pin 7 is connected to D15 Pin 10. The connection must be under the socket as I cannot see the trace. Also D10 pin 13 is connected to H10 (or 10H as it is called on page 9). The D15 missing connection should make no difference to the behavior since the TC pin is not used. The missing H10 would cause the system clock to be held off for refresh about 40 usec of every 65 usec. This would slow the system down and would be very close to the max cycle time limit of some early 6502's (40 usec on Synertek 6502). This is good information. I also believe that the connection between D15 pin 7 and pin 10 is on the top side, since it can go straight across from one pin to the other. Since this trace is not essential, there has been no way for me to to see whether it is present or not and it's not present on at least some Obtronix boards, I have been debating about including it or not. This resolves that dilemma. 1) For the LM320 and LM340 voltage regulators, I'm having difficulty reading the silk screen legend in the images that I have. This is printed directly on non-masked copper layer in the original, which was masked off on the Obtronix clone. I think it is possible that the LM340 has a "+" sign instead. 2) Are there any silkscreen or markings in the copper layer near position A and 1 of the expansion connector? I don't see anything in the images I have, but that would not be consistent with the other connectors on the board which have each end of the connector marked both in the copper and silk screen layers. Also it was interesting to hear about the problems with the LS logic on the A2. The designers used a couple of spare NAND gate outputs (a2-8 and A2-11) to pull up, the otherwise floating, inputs. One of these gates (A2-8) is pulling up 7 inputs, the other (A2-11) is pulling up 24 inputs! There is a label LM323K directly below the heatsink above the diodes labeled MR500 that are not MR500. I'm interested in the different TTL manufactures used. Are you saying that A-B are mostly Fairchild and C-D are mostly Signetics? Are they all original? Do you know when yours was built/bought? I have seen other Apple 1's that used all Signetics chips, so I am wondering where/when the transition happened. Also out of curiosity would you mind telling me the manufacturer (sounds like you were saying Synertek) and date of your 6502? The following is a summary of the Parts, Manufacturers and Date codes for the parts as they were my board when I got it except for a 2504 part that failed and was replaced by S Jobs a couple of months later. I got the board in the summer of 1976. When I got it the Basic was unfinished and did not even have an INPUT statement. Currently my board has a few parts that had failed and were replaced in the past year and the RAM was upgraded to 32K in about 1980. I do have all of the original parts except the 2504 at D14B that was replaced under warranty. The 9N series and 9316 are part numbers used by Fairchild on their early TTL. The 74161 was designed as a compatible replacement for the 9316 by other manufacturers. The 7451 is functionally equivalent as used on this board to the 7450 called out on the Silkscreen. 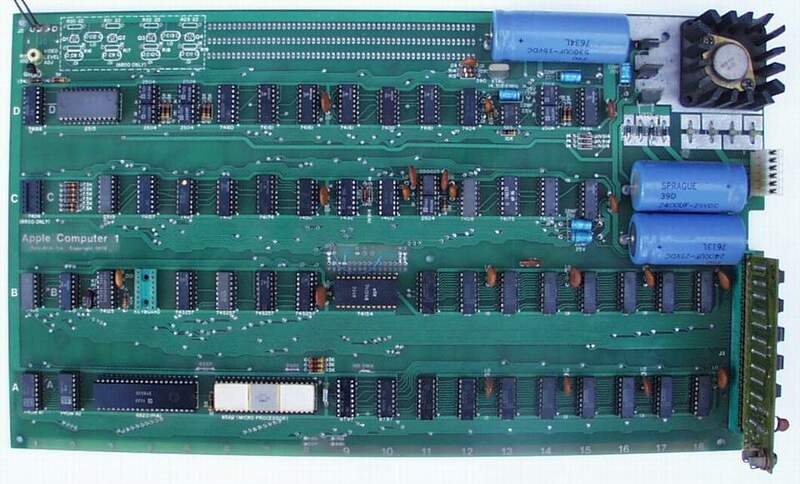 I looked at some pictures of Apple 1 boards I could find on Google. The 4 Ceramic parts at B5-B8 are very distinctive and can be recognized as to whether or not they are on the board. A brief look seemed to indicate that the picture by Achim Breidenbach on Applefritter and one from Computercloset seem to clearly show the Ceramic parts and the other labels look to be shaped consistent with my board. Pictures from Digibarn, the eBay $50,000 sale, and Retrothing seem to clearly not have the Ceramic parts and the labels on the other parts look different. It would appear there were at least two part sets used. This is great information. Thank you very much for posting! Would you mind posting a good image of your board? I have noticed differences in capacitors used on the Apple 1s too, so I am curious what you have as well. has been widely pictured on the Internet. The Woz board is a match to my board in parts and date codes except for the DRAMs and there are no voltage regulators on the Woz board. I believe this board was probably used by Woz for design validation where he could use external power supplies to margin test the board design. Since DRAMs were very expensive the original DRAMs would have been moved to shipping boards once the validation was done and the DRAMs on this board (which are date coded in 1977) were probably put back on later. Since my board was acquired in early August of 1976 from a Byte shop in South San Jose and Woz would have tested a first generation board, these probably represent the part set used on the original 50 boards built for Paul Terrell at the Byte Shop. This generation of boards used the Ceramic 74S257 parts and large Ceramic bypass Caps. that shows a board with the large Ceramic Caps, Plastic 74S257s, and TTL parts that appear to be neither Fairchild nor Signetics but I think they are TI. The picture is not clear. Some great information, wonderful images. As they made new batches, it seems like the Steve's found new vendors, probably to reduce costs. I'm sure that they would use up existing stock of parts before switching a particular part to the the new vendor, something every manufacturer does. It appears they even switched PCB fab houses, since I've seen images with the NTI logo under the apple logo and other boards, such as yours without an NTI logo. I think I've seen one with a different fab house logo, but can't find the image, right now. I haven't been able to find any another differences in the board, besides the fab house logo, though. If I'm not mistaken, all of the pictured boards, early and later have been flow soldered, since the vias are neatly filled in with solder, something that wouldn't occur if the boards were hand soldered. It would be interesting to see if there are any hand soldered boards in existence. The idea of the Steve's laboring with soldering iron and boxes of parts in order to meet the net 30 day financing seems kind of suspect, in light of what we see in the available images. I'm sure they did the bring up and debug, but that is much less time consuming than soldering on dozens of parts, if you know the design well enough. Another tell-tale sign of wave soldering is the uneven almost wavy surface of the large conductor areas on the back side of the board caused by the melting of the solder coat under the silkscreen. These areas were often hatched to minimize this. Woz said they were surprised how inexpensive it was to get the boards assembled and soldered so they probably had not designed the board with Wave Soldering in mind. The socketed parts were put in the sockets after wave soldering by Dan Kottke and others. The Voltage regulators were added after the flow process and those holes were kept clear by blocking them from the solder. I think they put things in the holes to keep them clear. The clean holes can be seen on the Woz board. That board was probably wave soldered although it might have been hand assembled. The third board type with a different fab house was my misinterpretation of this picture. It looks at first like a logo, but it is in actuality Achiem's copyright notice of the photo. Can you tell if the two different batches of boards have a different color soldermask? Seems likely from photos, but lighting can dramatically affect coloration of photos. One last question. How does it appear that the 5Volt regulator is mounted to the heat sink. I would think that to maximize heat transfer that it is simply bolted on with some kind of thermal grease in between the regulator and the heat sink, but it is hard to tell from photos. There are TO-3 mounting kits sold that include a mica washer, but I believe that that would counterproductive, as mica is a pretty good thermal insulator. With regard to silkscreen color, I did not notice a difference in color but the two boards are in different areas of the Museum under very different lighting so a small color difference would be very hard to see. It appears that the TO3 can is simply bolted down to the heatsink and I don't see any evidence of a residue at the heatsink boundaries that would indicate a thermal grease was used. The mica washer in the mounting kits is for electrical insulation and does reduce thermal performance. I've noticed a variety of parts used for MR500 and 1N4001. Do have any insight here? Are you aware of them ever being replaced on your board or someone elses? I think there were at least two board vendors involved in making Apple 1 PCBs. If you look under 'Apple Computer 1' on the boards that appear darker green (glosser? ), you will see (in copper) a board vendor mark (NTI in a diamond). The two boards I have a flat finish and lack the mark. I wonder if Dan Kottke would remember. BTW, the chip sets on my boards pretty well match yours. Also, no sign of heat sink grease here. Hi in bringing up my first Apple 1 clone board, I've had some intermittent video issues, which I traced back to the floating inputs on 74161s. Those inputs are most definitely not floating high. I was wondering if anyone has any information about whether different manufacturers implemented 7400 series chips differently such that behavior of floating inputs may depend upon manufacturer? To my knowledge all 7400 TTL parts were designed the same using a multi-emitter transistor for the gate inputs but there could be differences so it is probably worth trying a different part. The pull-up current is pretty large so that has to be overcome to pull down the pin. The pin when open will float to the threshold voltage of the Gate (about 1.4V) so they are sensitive to parasitic capacitive coupling into the pin. You might want to try extra cleaning on the back of the board in that area. I have seen flux residue cause those kinds of problems and the flux is sometimes hard to see. I found the issue. I was using 74161"A" parts that were shipped to me from my supplier. Data sheets indicate that "A" parts have a different I/O design. I was lucky enough to find a few non "A" parts locally, and the board now looks solid.